Let me just say that I have a fear of heights. Not the type of fear that makes you ball up into a fetal position crying for your mommy, but a fear none the less. Maybe fear is the wrong word. Men are not supposed to fear anything, so let’s just say that I have a serious respect for the affects of gravity on the human body from a high elevation. Yes, that sounds better. 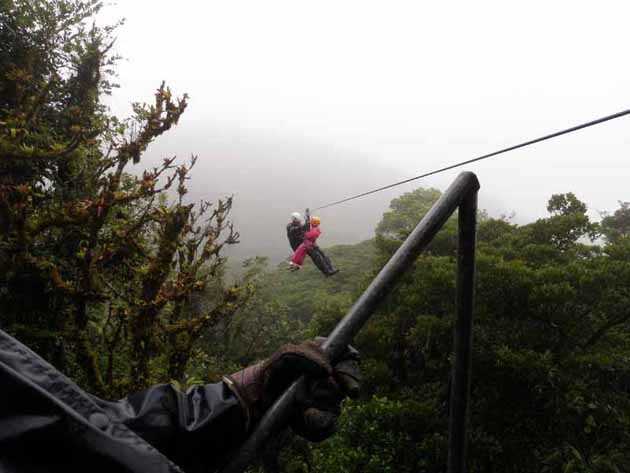 So when Kerri suggested that we go zip lining in Monteverde it sounded like a great idea. 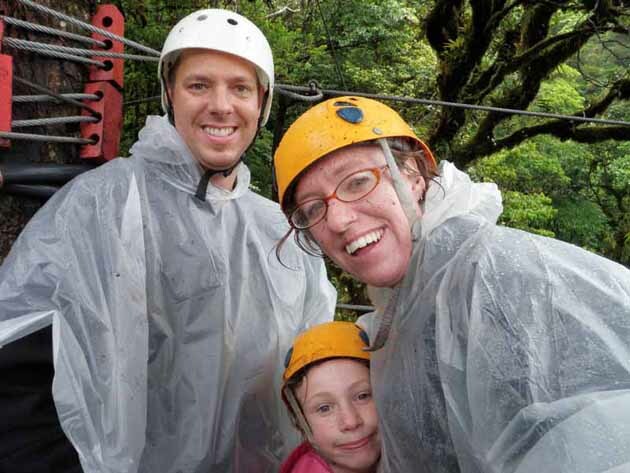 After all, going to Monteverde and not zip lining is like going to Paris and not visiting the Eifel Tower. It must be done. 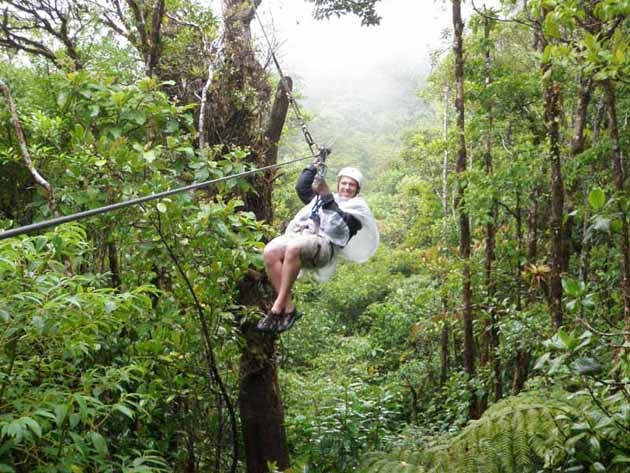 No true tourist can visit Monteverde, Costa Rica’s adventure capital, and not go zip lining. But sounding like a great idea verses the reality of zip lining was still to be determined. I woke up the next morning grumpy. 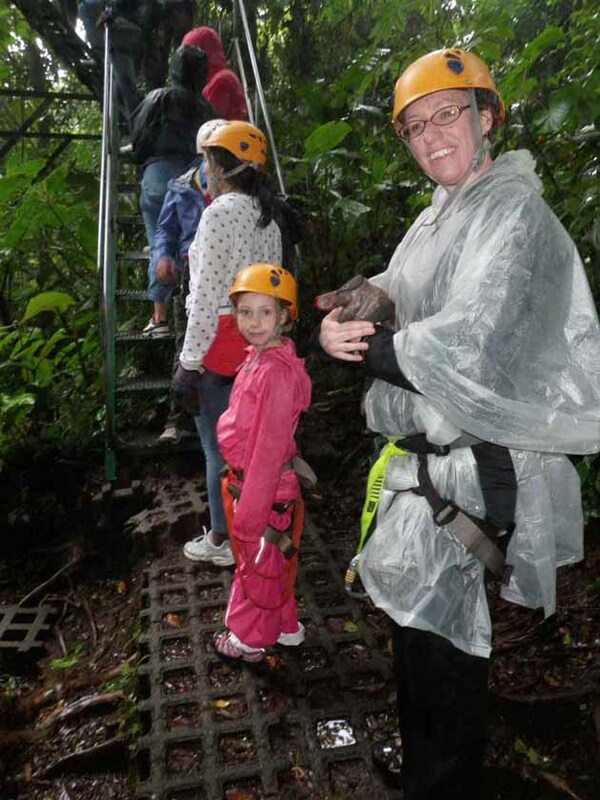 It was still raining and our shoes and jackets were still wet from the night before and a shuttle van would arrive soon to take us up to the cloud forest so we can go zip lining… in the rain. All I wanted to do was sleep in and then find a hot tub and a cold beer, but that wasn’t an option. 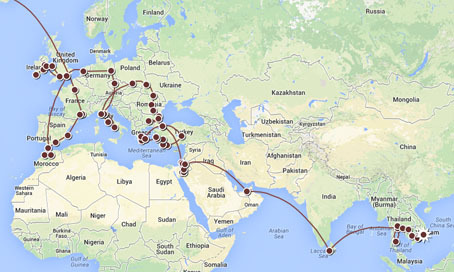 The closest I could get was a hot shower and a cup of coffee and that would have to suffice. After a quick breakfast the shuttle arrived. The van was full of tired tourists who were probably wondering the same thing we were, “Is this really a good idea?” We grabbed the last 3 seats and tried not to vomit as the van took us up a never ending bumpy road towards the adventure park. After arriving at the Selvatura Adventure Park we went inside and were very happy to find plastic rain ponchos for $8 each. Sydney’s rain gear was functional and so it was only Kerri and I that looked like plastic bag wearing dorks. But at least we would be dry dorks! 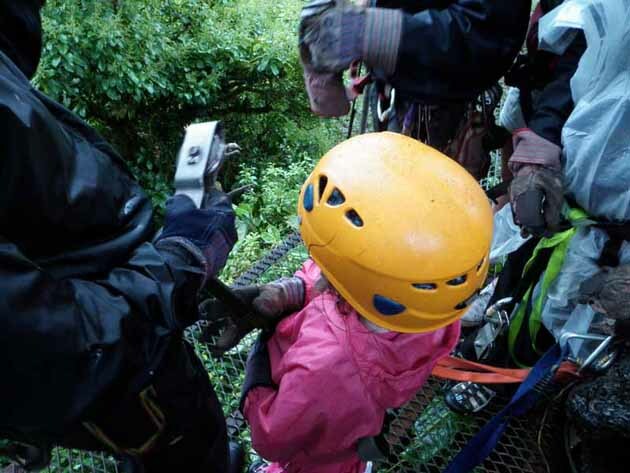 We paid for the zip line canopy tour and made our way into the room to get our gear fitted; helmet, harness, pulleys, and leather gloves. Because of Sydney’s weight, or lack thereof, she had her own personal guide that would take her on the tour. 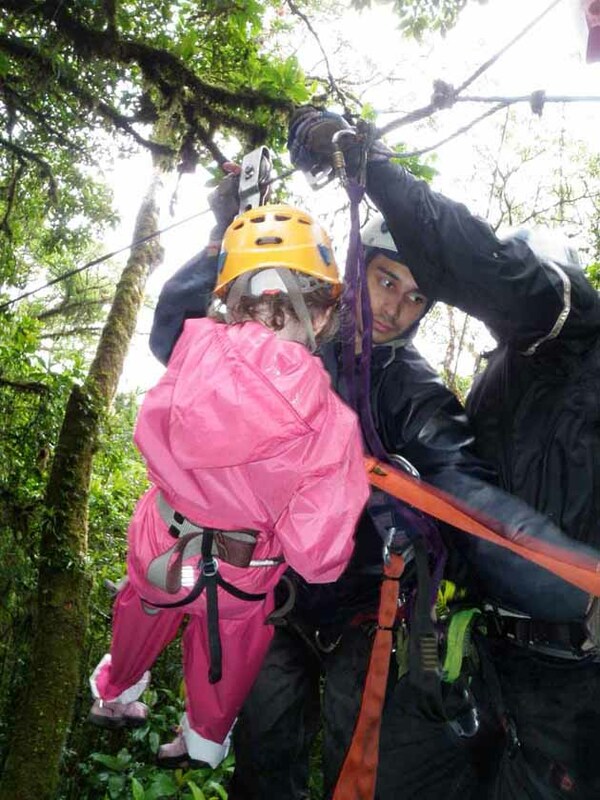 We were placed in a group of other thrill seeking tourists and loaded into a van to be shuttled out into the cloud enshrouded rain forest. 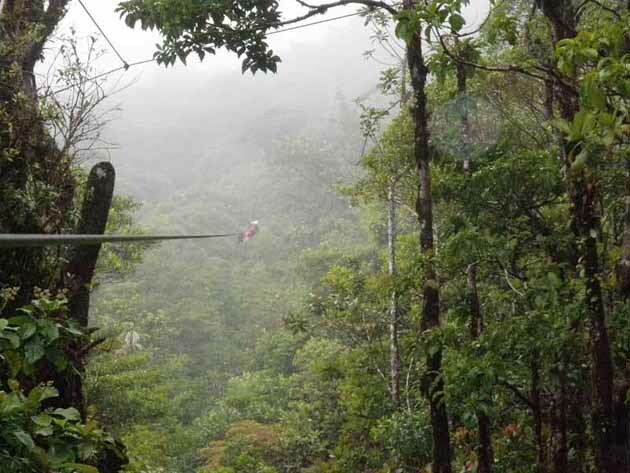 Once at the starting point of the zip line canopy tour, we were marched up a trail through the jungle with the sound of our metal pulleys clanging against each other. After a short demonstration on how to zip line, we climbed the first tower. Did I mention that I don’t like heights? We all nervously watched as Sydney was attached to the zip line cable with her guide and then launched off the tower over the green canopy far below and landed safely at the next tower. Next went Kerri and then it was my turn. Once attached to the cable I pushed off not knowing what to expect and quickly gained speed. 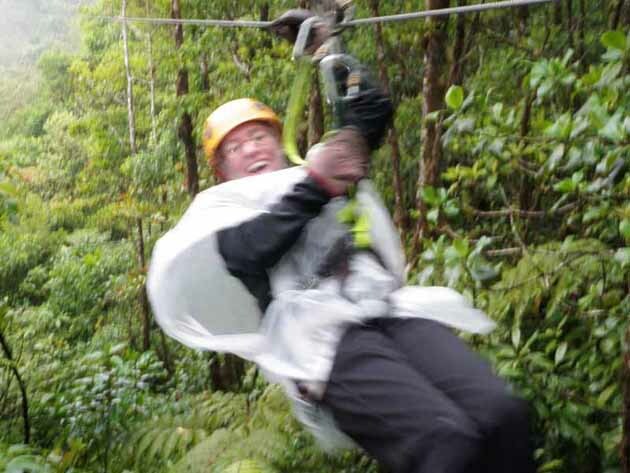 While feeling very nervous while standing on the tower, my anxiety quickly dissipated at the sheer joy of zooming over the lush canopy of Costa Rica’s rain forest. This was fun! At the next tower everyone in our group had large smiles on their faces, especially Sydney. On the last zip line section (number 13) we had to go tandem. The distance of this section was a full kilometer long and we were told to not touch the cable to brake! Kerri was attached to the cable first and then I was attached behind her and placed my feet around her waist. We were all a little puzzled as to why we had to go tandem, but whatever. The visibility had diminished and we could not see the other end of the cable. We launched off the tower and quickly gained speed. It was a very unnerving feeling to not be able to see where you are going. Our speed kept increasing and the rain droplets started to sting as they hit my eyes and exposed skin so I found relief looking down at the canopy far below. We made it to the other end and had a new appreciation for zip lining. 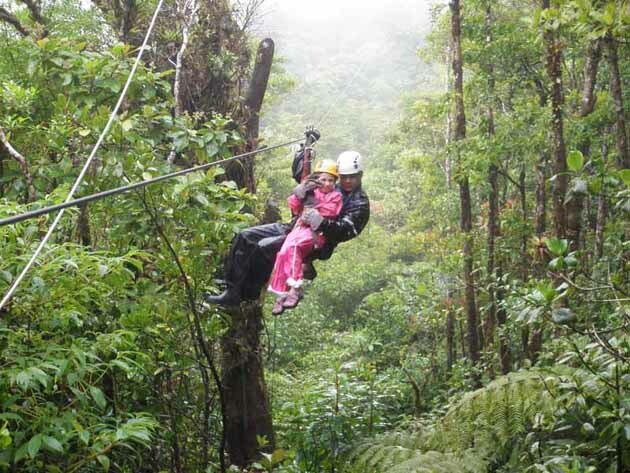 It will be hard to pass up zip lining anytime we come across it while traveling. It is just way too much fun!